You’re ready to share your big idea with an even bigger audience. 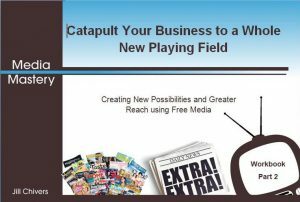 You’re ready to increase your profile and credibility on a bigger playing field. You’re ready to learn more about media mastery on a small budget. You’re in the right place. The Media Mastery Workbook is for you. Designed to be interactive. This is a Do it Yourself approach to media mastery, specifically designed for entrepreneurs and solopreneurs who are on a budget or who are just starting out. Accessed immediately. It is a downloadable workbook. Once you download the Workbook onto your own computer, it is then yours to use over and over again! Thorough. It covers key aspects of the 3 phases of media: preparation, during, and after/follow-up. There are no gaps, no guessing. Part 1 focuses on the 20 secrets and strategies you need to attract free media and prepare for your media interview. Part 2 focuses on the 15 secrets and strategies to use during your interview and as follow-up after your media interview and the Bonus strategies. Each of the nearly 40 secrets and strategies has a minimum of one activity or exercise to bring the material alive and inspire you to Use It Now! Media Mastery for Entrepreneurs is completely free as my gift to you. Click on the link to open in your browser or right click and Save As or Save Target As to save your computer for printing and reading later. “When my first book was published, I paid more than $10,000 for a publicist. While she managed to book me for a decent number of radio gigs over 30 days, after that I was on my own. Through my own efforts one of the bookings repeated twice. It was expensive and I never got the sense that the publicist cared about my book an my business anywhere near as much as I did. What’s good about Media Mastery is that it gives you the keys to the kingdom – so you can get what you want, because you care about it so much more than anyone else does. And Jill doesn’t just tell you how to get the gig. She gives you a wealth of practical ideas on preparing, what to say, what to wear… and then more on how to make the gigs repeat. On the price alone it’s worth it, and the sky’s the limit on what it will do for your business, your idea or your book. No guesswork. I’ve taken the guesswork out of becoming your own media department. If you aren’t sure what to do, where to start and what to do after that, this workbook will show you how. If you don’t have time to waste trying to “work it out” on your own, or make mistakes that will derail your media efforts, this workbook is for you. No cost. It is possible to attract media appearances on television, on radio and in print without spending a fortune on a publicist, or paying an even larger fortune on advertising or infomercials. If you don’t have between $5,000 and $20,000 to spend each month on a targeted, tailored PR campaign (or $500 – $1000 to spend having your press release written), this workbook is for you. You can’t get any cheaper than free. Opportunity cost. You’re a busy entrepreneur. You don’t need another thing to “figure out”. The opportunity cost of your time is huge, and you know its false economy to not invest in programs and services that save you time – hours and hours of time. Sure, you could scour the internet for info in each of the sections I cover in the Workbook – you wouldn’t find everything I cover and it won’t be material geared toward you taking action. You’ll lose hours, if not days – time you could have spent starting your media mastery journey. You’re looking for someone else to do it all for you. This is a Do It Yourself interactive program where you do the doing. Nobody is invested in your project quite as much as you are and you are perfectly positioned to craft a compelling approach to the media and deliver an outstanding media interview – if you know how. You’re looking for a quick fix or result and your focus is only on getting into the media (and not on developing a longer-term and deeper media strategy). There is no magic or silver or any other kind of bullet when it comes to being successful in and with the media. There IS a proven process that works – if you work it. You aren’t prepared to take focused, purposeful action. This Workbook will be next to useless if you don’t take any action. I’ve made it as easy as possible to take the required action by including a Your Action section at the end of every strategy (sometimes there are two or three Your Actions to take – so the Workbook contains over 40 Actions you can take). Here’s the thing on action taking: only you can do it. The Workbook isn’t designed to be read – it’s designed to be used.